I haven't been checked by a doctor in a good while but Dr. Botello is very nice, she is understanding andoverall the best so far. My waiting time didn't take long, it was a smooth appointment in a timely manner. I would totally recommend her to anyone. I haven't been checked by a doctor in a good while but Dr. Botello is very nice, she is understanding and overall the best so far. My waiting time didn't takelong, it was a smooth appointment in a timely manner. I would totally recommend her to anyone. 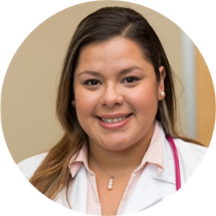 Crystal Botello is a dedicated and detail-oriented family nurse practitioner serving the community of San Antonio, TX. Ms. Botello attended Texas A&M University, where she earned her bachelor's as well as master's degree in nursing. Ms. Botello is a part of MedFirst SouthEast. Ms. Botello is dedicated to helping patients receive the treatment they need so they can enjoy a positive and fulfilling lifestyle. She is committed to helping her patients enjoy a healthier lifestyle. She works with each one to discuss ways they can make better choices for their health. FNP Botello was very attentive and thorough. Every question I had was addressed, every question my husband had was addressed and we left feeling very educated and informed of what to expect. The other staff on FNP Botello’s team is equallygreat. Very personable and kind. The phlebotomist who drew my blood made the process as easy as possible with great humor. Definitely recommend this staff in all your needs. She was really nice and very informative when I explained my concerns. Everyone at the office was nice and friendly. FNP Botello was great as usual. Always answers all my questions and she has great bedside manners. I was very impressed and satisfied with my visit. DR. Botello was very thorough with my visit. She requested lab test and prescribed the necessary medications. Very sweet, everyone in the office was very friendly and readily answered my questions. On site lab is very convenient! So is the EMR! I feel I am in good hands! Oh, and they called me back early! Ms. Botello was very professional and explained things to me in a very simple way that I could understand. She was great. She explained my course of treatment and helped me feel optimistic about my recovery. Will be coming back to see her! She is very sweet and attentive. Very comfortable with Ms Botello. She was open and receptive to my views on my illnesses. Botello is very professional, knowledge, and very clear when explaining things to patients. I'm extremely satisfied with Crystal Botello & the staff. First impression was great, very informative. Great communicator and bedside manner. She was thorough and explanatory with treatment recommendations. Again Crystal Botello was fantastic. Treated and diagnosed my son and got prescriptions to pharmacy right away. Crystal Botello is very knowledgeable. She has excellent bedside manners. The office staff is courteous too. Would recommend to anyone. Dr. Botello was thorough, extremely nice, answered all my questions, and not once did I feel rushed. Definitely, plan on scheduling any future doctor visits with her.